Awards & Scholarship Program: Recognition of achievements. Assistance for education and travel/exchange programs. Career Center: Your resource whether looking for your next career move or to hire your next valuable employee. Committees/Task forces: Apply your expertise to developing programs for the Association. Global Volunteers: Opportunity to travel to underprivileged areas to teach wound care. Journal Club: Join us for these monthly webinars - FREE to members! Speakers Bureau: Speak at conferences, regional meetings or other engagements. 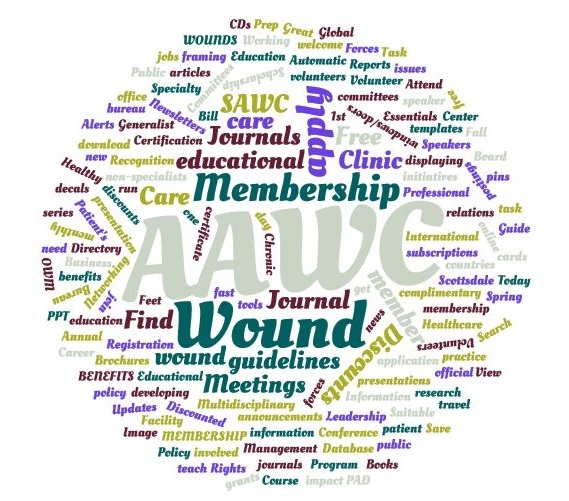 Wound Care Glossary: Created by AAWC Members to advance the practice. Journal of Wound Care (JWC) – our members receive a 15% discount. Membership Directory – Update your preferences so others can find you! International Wound Journal – Free subscription. Weekly AAWC Newsletter delivered to your email inbox with the latest wound news and information right at your fingertips. As members engage the content from week to the artificial intelligence engine will learn your preferences and suggest the most relevant articles to you. Certificate of Membership, wallet card and member decal. Wound Patient’s Bill of Rights – suitable for framing and display. Proud Member AAWC Logo for use on business cards or websites. Information & Support any time you need it.